It's been a lot of fun cataloguing and recognizing the best video game music of the year. We've gone from AAA blockbusters to indie games, sweeping melodies to ambient synths, heroic themes to dread-soaked atmospherics. Some of the games built music into their gameworlds, while others brought in full orchestras and still others used the kazoo as a stand-in for the protagonist. Readers wrote in a whole bunch of worthy Readers' Choice nominations, and between those games and the thirteen that we highlighted, I'd say we came up with a list that is damn near definitive. In order of publication date, here are the best video game soundtracks of 2011. 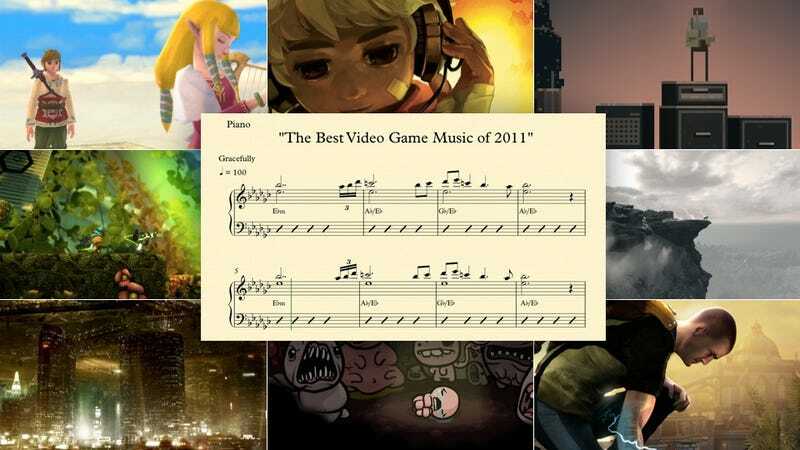 We've already recognized a whole bunch of the best game soundtracks of 2011. But of course, there are only so many hours in the day-only so much time to play games, and one can only write about so many game soundtracks.